A tip for perfectly cut brownies – use a nonstick knife! Ever cut a pan of brownie and get misshapened squares with ragged edges? 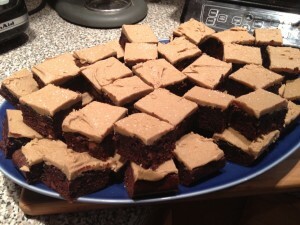 For years, I hated the look of my brownies and then I read a tip recommending using a plastic knife. The brownies don’t stick, giving a cleaner cut. It was certainly an improvement – but not perfect. Plastic knives are cheap and flimsy, and it was hard to get a consistent, straight edge. Then I saw Kuhn Rikon’s line of nonstick knives and decided to give it a try! I made a pan of dark chocolate brownies with salted caramel frosting and they look perfect! Another tip? Wait till the brownies cool completely. It’s hard to wait as warm brownies are delicious, so it’s up to you to decide between form and function. Error running style: S2TIMEOUT: Timeout: 4, URL: gltsoi.livejournal.com/147896.html at /home/lj/src/s2/S2.pm line 531.